April 17, 2012 0 comments on "How to Grow Potatoes"
I have had a garden for several years now, and have been trying to grow a variety of herbs and vegetables. This year we decided to try growing potatoes. I remember growing them as a kid and digging them up in the fall. What fun! There are a number of ways to grow potatoes, even in a small space. For us space wasn’t an issue, so we used the trench method. You can also grow them in a stack of tires, a garbage can, or in straw. Short on space? You can also grow potatoes on your patio in these great potato tub growing bags you can get really inexpensively from Amazon. Potatoes should be planted in early spring. Potato plants are grown from “seed potatoes”, which are potatoes that have buds or “eyes” growing out of them. Seed potatoes can be cut into smaller pieces. You just need to have at least two eyes on each piece so that they will grow. Most experts agree that seed potatoes should be planted 2-3 weeks before your last expected frost date. You can purchase seed potatoes at any nursery. There are a number of varieties of potatoes you can grow, like russet, red potatoes, yukon gold, to name a few. I planted my seed potatoes directly in the ground in rows, 6 inches deep and approximately 2 feet apart. Seed potatoes should be planted 12 inches apart, with the eyes facing up. Next lightly cover the potatoes with dirt. As the potatoes grow, green growth will sprout above ground. Mound dirt around this green growth to cover it up. Do this until the 6-inch trench you originally dug is filled in to ground level. Then you can just let the potatoes grow. Potatoes should be harvested in the fall when the green growth starts to die. Using a pitch fork, dig down 4 to 6 inches around each plant and dig out potatoes. Don’t dig them up early, green potatoes are actually poisonous. Harvested potatoes can be stored in a cool, dark area for several months. Check them periodically to throw out potatoes that may have rotted, don’t want to ruin the whole batch! Occasionally you may find that your potatoes may be affected by blight or one of several viruses known to affect potatoes. 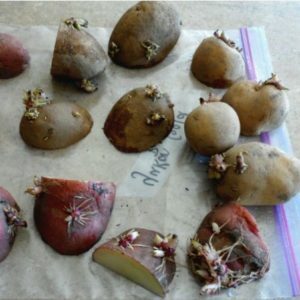 Check out the Beginner’s Guide to Planting Big and Healthy Potatoes to find out how you can address these common issues. Growing potatoes is a fun activity you can do with the whole family. For more information about ideal soil conditions, how and when to plant, etc., check out these sites: The Backyard Gardener and Harvest to Table. I’m excited to dig up my potatoes this fall. They are growing like crazy. We will have to try growing them in a container another time. I read that you’re not supposed to plant them in the same place two years in a row to avoid disease and pest problems.